To gain a wider understanding of disparities in wealth & development, it is vital to have a real appreciation for the plight of people and places who often fall well below our radar of 'news worthiness". The following report from Dan Snow gives you a real flavour of the issues faced by modern day people who do not share the same quality of life and levels of equality as we enjoy in our everyday lives. This is a country that you will encounter for only negative reasons in your IB course. You've probably never been there & don't know much about it. A country that is bottom of just about every development league table going. Congo's tragic history is traced in this case study and by the end, you will perhaps realise why the development gap still exists in 2016 and is getting bigger and bigger year on year. A must read for all IB Geography students out there. Task 1 - Split the class into pairs. Hand each pair this blank template. Lay out six copies of this infographic on a table at the front of the classroom but hide from view. Each team member has 1 minute to stand at the front of the class and memorise as much as possible before heading back to the group and filling in the missing details. 3. No taking photos of the infographic with camera phones!! Here is an original online copy of the infographic. Link with IB French - Click here to be taken to an animation showing issues surrounding rapid population growth. Make notes on the key points being highlighted. Task 2 - Watch the 7 Billion: Are you Typical? YouTube video beneath and use the worksheet below to record the features of the 'average world person'. Objective: To gain a clearer understanding of the issues that have led to an increase in population and to find out what has been done historically to address the situation. Task 1 - You will need to spend 45 minutes watching the BBC documentary embedded below. As you watch the film, you should fill in this worksheet so that you have a record of content. Task 2 - Watch the video entitled Overpopulation: The Making of a Myth. Do some more research online to get the big picture of this counter-argument. Outline the theories presented. What are your views? Is it a credible alternative? Objective: To plot population statistics over time using data provided. You need to be able to explain population trends and patterns in births (crude birth rate), natural increase and mortality (crude death rate, infant and child mortality rates), fertility and life expectancy in contrasting regions of the world. You will need a copy of the 7 graph sheets to complete this piece of work. Once you have a completed set of data, please hand to your teacher so that they can be copied and distributed to everyone in your group. Objective: To refresh our knowledge on patterns and processes shown in population pyramids and to define and work out Ageing and Dependency Ratios. Watch the first YouTube video below that reminds you how to interpret a population pyramid. Task 1 - Have a play with this population pyramid animation site. i. Check out your home country. ii. Take a screen shot of 2010, 2050 & 2100 and describe changes underneath. 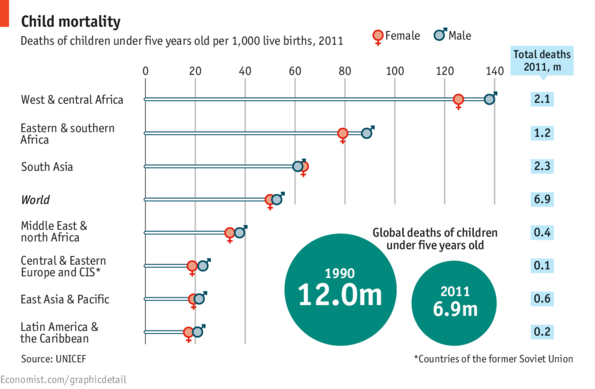 Refer to the dependent population (0-15 & 65+ yrs old) , birth rates & death rates. Mark your location according to your date of birth on the pyramids. 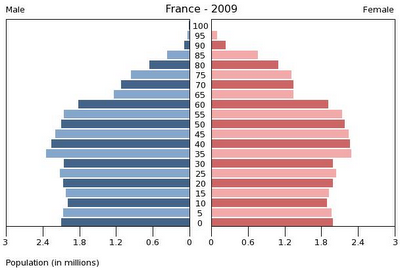 Task 2 - Look carefully at the population pyramid above right hand side. Take a screen shot and then write down the reasons why previous French President, Nicolas Sarkozy, announced that the retirement age in France is rising from 60 to 62 years old from the 2018. Task 3 - Click here to be taken to geogaphyalltheway.com (subscription required). Complete the activities set out on the page. Quick Graphing Task - Using this link from the World Bank, create a comparative chart that shows the positions of each of the IB Five & France in terms of their total dependency ratio (see colour coding key below). You should plot the data from 1995, 2005 and 2015. Now complete the Dependency Ratio work sheet using the first blue tab below. Quick Graphing Task - Using this link from the World Bank, create a comparative chart that shows the positions of each of the IB Five & France in terms of their ageing ratio (see colour coding key below). You should plot the data from 1995, 2005 and 2015. Now complete the Ageing Ratio work sheet using the second blue tab below. ﻿Objective:﻿ To distinguish between population growth and population momentum and to understand the definition of each. To find out how population momentum impacts upon population projections. Task 1 - Watch the first 3:04 YouTube video to the right and make notes on this sheet. 1. What does a demographer do? 2. Outline what will happen to the population of Uganda by 2050 and 2067? 3. What is this population number based on? 4. What is the current fertility rate in Uganda? 5. What are the three variants and what do they assume in Uganda's case? 6. Why is predicting a projection for a currently fast growing population tricky? Outline and the four principles. 7. What does the world population projection graph show for future growth? 8. What confuses projections for the future? Think about it - Is population growth all that bad?